We regularly feature in Ebossnow Magazine showcasing our systems in completed projects. Check out the articles below to see how we helped our clients achieve their desired result. KerMac Industries offers a wide range of cabinetry services including vanities, lockers and cubby hole storage units to complement their toilet cubicle range. New and improved K-Childcare system installed in Nurture Early Learning Kindergarten, Onehunga. Kermac Industries' K-CDF Compact 13mm toilet partitions and Permanent K-Wall Linings offered durable solutions for two Auckland primary schools during recent bathroom fit-outs. KerMac's K-Compact Toilet partition design has been restyled to offer greater affordability, robustness and accessibility. K-FloorMounted toilet partitions by KerMac Industries have been installed at the recently completed Te Atatu Community Centre and Library as designed by Moller Architects. KerMac Industries recently installed its toilet partitions in refurbished offices at Turners and Growers in Mt Wellington, Auckland. 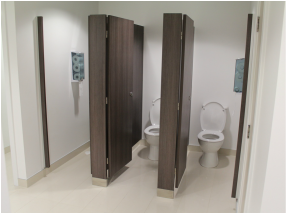 KerMac Industries recently completed installation of new toilet partitions at Dressmart Onehunga using a design specified by Ministry of Architecture and Interiors Auckland (MOIA). 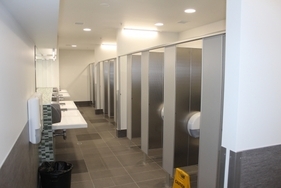 Kermac Industries' K-Moda System provided clean lines for a bathroom re-fit at the Millennium Centre in Auckland’s Greenlane.